An AFR/Lambda-Gauge is a must for anyone looking to maximize engine power output, maximize saftey and engine life by using advanced tuning monitoring. When tuning an engine, accurate Air/Fuel Ratio data is critical to maximizing performance and safety. Running too rich can cause a loss in power, while running too lean may result in serious engine damage or engine failure. The AEM Wideband O2 UEGO Gauge features large LED numerals which enable the user to see very quickly when there's even a .1 change in ratio, providing time to shut things down before any engine damage can occur. Each gauge comes with interchangeable black & silver bezels and black and white gauge faceplates for multiple color combinations. The unit?s 52mm gauge housing fits in most gauge pods and can be remotely mounted virtually anywhere. 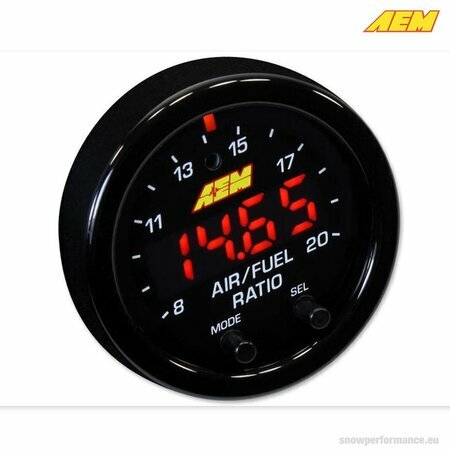 All AEM digital gauges feature a 0-5v analog output for use with data loggers and virtually any engine management system.